Should we be worried about latest bacon headlines? Home > News > Should we be worried about latest bacon headlines? Recent headlines warning consumers of the risks of eating bacon need to be put into context, according to pigmeat industry representatives. 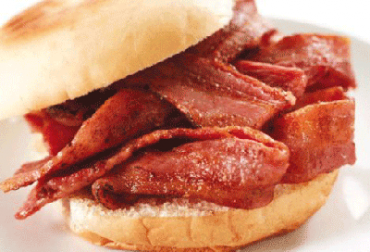 A number of outlets, including the Daily Mail, ran with sensational headlines suggesting three rashers of bacon a day raises the risk of dying from heart disease by 25 per cent'. This was based on research concluding 50g a day of processed pigmeat - about two slices of ham or three rashers of bacon - raises the risk of dying from cardiovascular disease by 24 per cent. Quoting findings published in the Journal of Internal Medicine, the articles also claimed this level of consumption makes death from cancer eight per cent more likely, increasing the risk of pancreatic, bowel, breast and prostate tumours by varying degrees. Bacon consumption was linked to higher diabetes levels, while experts also made the connection between higher global meat consumption and environmental problems. So should the industry be worried by yet another wave of publicity questioning the health impacts of our product? Well not necessarily, according to NPA and AHDB Pork, as long as the headlines and the findings behind them are put into context. NPA chief executive Zoe Davies said: “We are hugely proud of our British ham and bacon, which remains much-loved by the public. “Of course we are never complacent about these sorts of studies and always have one eye on the wider issues around production and consumption of our products, but these results are often reported in a sensationalist manner which does not reflect the real risk, which is in fact minimal”. A spokesman for AHDB Pork said: “None of this is new, it is all old material being recycled.